MRCP(UK) aims to deliver examinations of the highest quality and provide the best level of service for all candidates. We recognise that errors can occur and that on very rare occasions our examinations can be subject to disruptions that may affect candidate performance. To ensure that all candidates are assessed fairly, there is a procedure to allow candidates to appeal against their results. In investigating appeals MRCP(UK) will assume that candidates have read the information on this page and are familiar with the MRCP(UK) examination regulations and Appeals regulations. There were exceptional circumstances, such as illness or bereavement, for which clear evidence must be provided as soon as possible after the examination. Candidates are reminded that there is a right of withdrawal from examinations and that by appearing to take the examination they are certifying themselves as fit to do so. Disagreeing with marks awarded by examiners does not constitute grounds for appeal. In PACES, candidates are assessed by two examiners in each encounter, and their overall performance in each skill is assessed by multiple examiners across several encounters. As the two examiners mark independently, perceived discrepancy between the marks they award does not constitute a procedural error and therefore cannot form basis for appeal. The Clinical Examining Board will not review decisions made by examiners in PACES encounters at which they were not present. MRCP(UK) will never award additional marks to a candidate’s score in PACES. Report any issues on the exam day to the centre invigilators, administrators or examiners so it can be recorded. This is particularly important for candidates taking a Specialty Certificate Examination. Contact MRCP(UK) Central Office: policy.officer@mrcpuk.org to inform them about the issue as soon as possible after the exam. Follow this up by submitting an online appeal form when the results have been released. We are unable to respond to appeals raised via the post-examination feedback survey, as this is completed anonymously. Appeals are not considered before candidates receive their results, but collection of evidence at this stage will assist future investigation. Once you have received your results you can submit an appeal via the web form. You will receive an automated email acknowledgement confirming it has been submitted successfully. MRCP(UK) Policy Team carries out an initial review to consider whether a candidate has grounds for appeal. The candidate will be informed if it is considered that there are no grounds for appeal. If the appeal does have grounds, it will be investigated in accordance with the procedure in the regulations. Invigilators, examiners or other candidates may be contacted for comments. These will be included in a summary report which is submitted to the Examining Board for review. The Examining Board will decide whether the appeal should be upheld based on this evidence. They may occasionally ask MRCP(UK) staff to collect further information. Decision will be communicated to candidates as soon as possible. It can take up to 60 days to respond to appeals owing to the length of time required to collect information and the number of appeals received, although we will try to respond quicker than this if possible. Candidates are advised to apply for the next available diet of the examination, even if they have not heard about the outcome of their appeal. Upheld – the candidate is awarded a condoned pass. Candidates should note that it is not normal practice to change results and that condoned passes will only be awarded very rarely and at the discretion of examining board chairs. 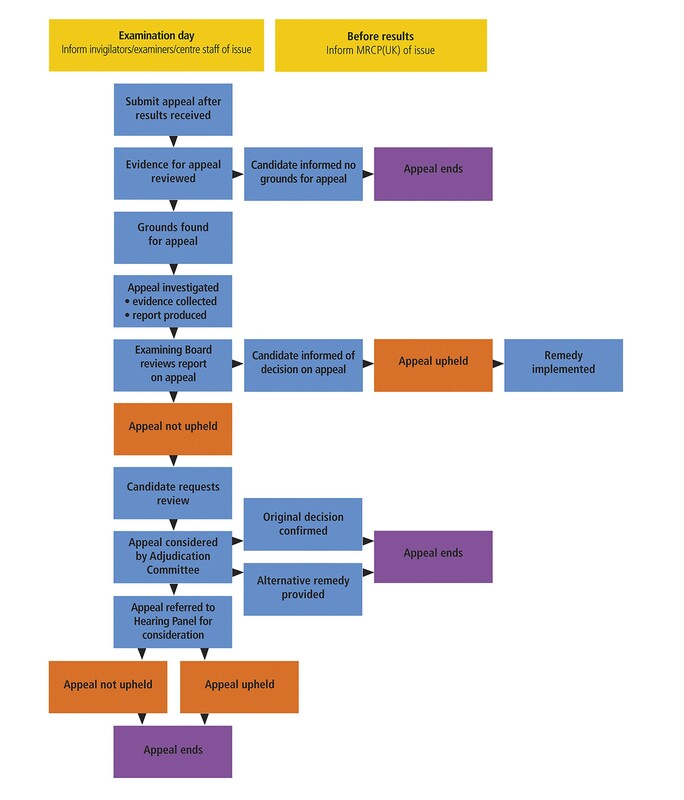 If the candidate's appeal is not upheld and they are not satisfied with the decision, they can request that their case be reconsidered by an MRCP(UK) Appeals Panel. Such requests will be reviewed by an Appeals Adjudication Committee (AAC) consisting of senior MRCP(UK) officers, a lay representative and a trainee representative. This will determine whether the decision of the board was reasonable, whether any further investigation can be conducted, or if there is evidence for offering an alternative remedy. If the AAC decides that the Board’s original decision should stand, candidates will be informed and the appeals process ends. If an appeal panel is convened, candidates are advised that this process can take several months and may not result in their appeal being upheld. Further information about the appeal panel process can be found in the Examination appeals regulations. Appeals must be submitted using the online form within 30 days of results release otherwise they will not be accepted.